Making a business plan is the foundation of every restaurant marketing strategy. We are all used to lengthy elaborations about how we want to conduct our businesses, but this idea is long gone now. We live in times when we try to make everything simpler, smaller, and better – and so we do the same with the business plan. You probably noticed that this is the trend nowadays: to minimize everything (and this includes restaurant marketing, too). The same goes for creating a business plan. Nobody wants to have to go through something that (by its size) could easily be interpreted as a book. Make it short, lean, canvas style. Lean canvas is a kind of table that substitutes a regular business plan. The idea is based on the Business Canvas Model and is dedicated to startup creators – so you too. It’s simplicity will help you point out what the most important elements are and allow you to focus on developing every detailed matter separately, for example, your restaurant marketing strategy and restaurant management plan. Why not a regular business plan? Once you start writing it the old-fashioned way, you will find out it’s a never ending story. You will have to jot down every little detail of your restaurant marketing strategy, put in all the formalities – simply everything. By choosing lean canvas, you’re making this all easier not only for yourself, but also for your partners. Did we already mention the simplicity? Sure we did, because it’s amazing! You only put what’s most important on your lean canvas, but it’s not like you leave out all the rest – you can always discuss it with whomever you want. Well, length, obviously. And the amount of details. Clarity is also a plus of lean canvas. All these features make it less confusing than a regular business plan might be. It’s hard to comprehend all the specifics written down in a traditional business plan – a lean canvas is much less overwhelming. If simplifying your work is your future restaurant marketing strategy, you should start implementing it in your business plan. 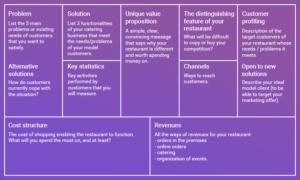 There are some integral elements of lean canvas, in the same way as there are some parts of the restaurant marketing strategy that you cannot leave out. The main elements of lean canvas are the following: problem, customer segments, unique value proposition, solution, channels, revenue streams, cost structure, key metrics, and unfair advantage. Some of the lean canvas elements are easy to fill in, some are head scratchers. Think the whole thing through and make some drafts before actually creating one on your own. Ponder each element separately, get to know more if you feel like you have to. Find some examples online, maybe one of them will inspire you. Some people might not be convinced by lean canvas. Isn’t it just too simple? And why change the thing that served us so well for so many years? Well, the best is always the enemy of the good. If we were all afraid of making changes, we would still be using pigeons instead of Messenger. Dream big and use all the tools that you can to help you, i.e. 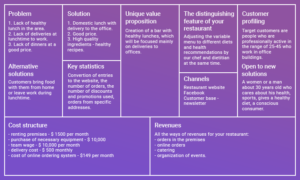 lean canvas and an online food ordering system, just like UpMenu. Building a startup is always a challenge and it comes with a lot of new things to comprehend. You can make it a little easier by making the right choices – and lean canvas is one of them. Thanks to this method you can put your whole business vision on a single sheet of paper. It’s easy and extremely helpful. Use this simple table to speed up the whole process of creating a startup. Save yourself some time and energy – you will definitely need it later.